Pelenna Patchworks: New fabrics with Michael Miller's Round Up and the Benartex Metallic Lace range! New fabrics with Michael Miller's Round Up and the Benartex Metallic Lace range! We have two brand new but very different small ranges available from today. 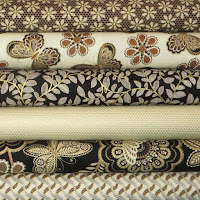 Firstly, the sumptuous Metallic Lace fabric range from Benartex's Dover Hill Studio - gorgeous fabrics in ebony and ivory with metallic gold highlights that really lift the prints. With designs including butterflies, flowers, ribbons and leaves this collection can be used to bring a touch of luxury to any room! 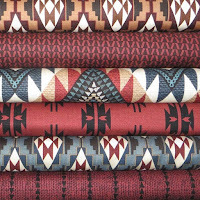 The second collection is the unusual Round Up fabric range, a set of prints inspired by Native American woven fabrics, by Michael Miller. In earthy, natural colours and a range of geometric prints, these fabrics would be great for a striking, grown up quilt or for dressmaking!